I wanted to extend the range of my wifi in the house and had a old router laying around id thought to use to do. I cascaded my 2nd router to my main modem/router and all works fine until i turn on the tv cable box connected to the 2nd router (rather then making more holes in the walls i connected the tv box to the 2nd router). It will turn off both wifi's, main and 2nd router. 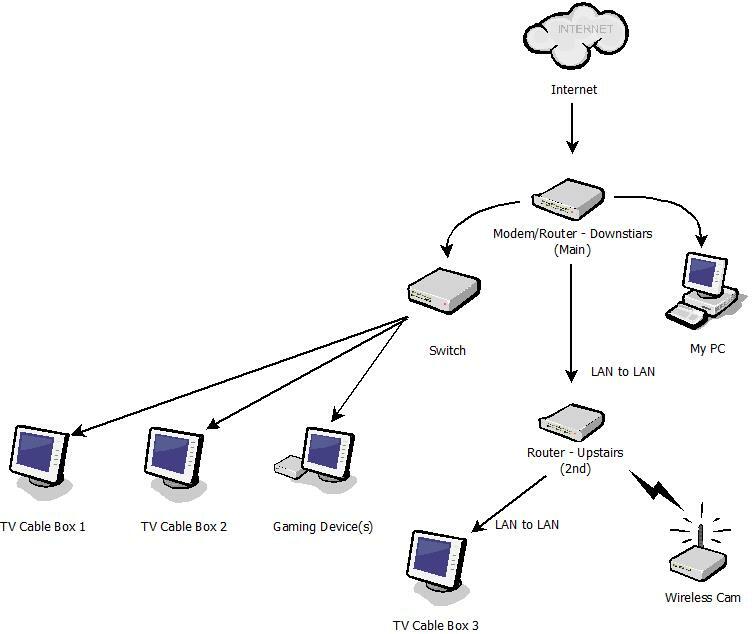 I can connect my laptop or other devices wired to the 2nd router and not get the problem and i narrowed it down to only when i turn on the tv cable box that is on the 2nd router. the cable will work fine and normal if turn it and watch tv. I just wondering why would this be happening and is there a fix for this. You can't have more than one router. There gets to be conflicts and eventually you overload the network as they fight out who controls the network. It's like having two drivers in one car sitting in the same seat. You need to switch the mode of the router to bridge, or access point. As a rule of good network design you should never go more than 2 layers deep for small setups. You add latency. BTW: I'm not going to look at your setup, because I don't click shortened links which don't give me a clue as to what I'm going to. That's just asking for trouble. Sure you can more then 1 router. People do it all the time. I have my 2nd router config correctly as it works perfectly fine with wired or wireless connected devices to it BUT just that one TV Cable Box (cable box 3 in the image). Once its turned on, its somehow shuts down the wifi on both routers. Wired devices to it still work fine though. Im just wondering as to why it does that. I don't know how one connects a TV box (set-top box?) to a WIFI router. Is this TV box doing IPTV? The input to this TV box is ethernet? Using two routers only works if you configure them properly. I'm going to assume your Router - Upstairs is configured as an AP, Bridge, or at the very least connected via the LAN port (not WAN) with DHCP off, if you are saying it is working correctly. First try using a unique SSID wireless point for each and see what happens. If that doesn't help, use the available android app "wifianalyzer (open-source)" by vrem software development (available on github and google play store) and look at which channels both wifi points are using. Try to assign them to different channels if they are laying on top of each other. It's really odd that it's killing the wifi when it's hard wired. Does the IP box contain it's own WIFI that could be stomping all over it? If you have a cyclic condition you could eventually crash both routers. But that would kill traffic on all devices. Can I connect my Ethernet cable from my wall to a router and use it for WiFi?